In this short hands-on article, I will be looking at various ways in which a school history department can ensure that it remains vital and relevant in a 21st century school. Why is it necessary to actively promote history at your school? It is certainly no secret that the number of pupils in South Africa taking history at school has declined significantly over the last twenty years. While there are some indications that numbers have stabilised, or in some instances even grown slightly over the last few years, there is no room for complacency. Another factor of concern, given the highly complex and academic nature of History as a discipline, is a tendency for the brighter learners to opt for other subjects, because they require less effort to score an A and are frequently seen as more relevant to life after school. One of the problems with history is that outsiders still tend to labour under two misconceptions namely that history is all about learning reams of facts and that its usefulness to learners after they leave school is distinctly limited. These are obviously key areas that need to be addressed in any campaign to promote history at your school. Who are the main targets of your campaign? * These learners' experience of the subject needs to be made as stimulating and interesting as possible. Learners are more likely to resist counterarguments to doing history if their own experience has been a positive one. * Learners need to be able to look ahead to the remaining grades of their school career and be assured that Grades 10, 11 and 12 will continue to be interesting and stimulating. * Learners need to be reassured that they will not suffer any disadvantage from doing history instead of subjects which on the surface at least seem to have greater career relevance. Parents Â This group are likely to have their own prejudices which you will need to overcome. In some cases it will be from their own experience or from that of their classmates when they were at school. It will obviously be just as important as with the learners to persuade parents that their children will suffer no educational or career disadvantage from doing history. School Management Â This is not always a problem and sometimes a sympathetic management can actually help the subject flourish. However, in some schools the management has a negative attitude to history and sometimes works actively to marginalise the subject. History teachers in these schools will have to take active measures to win over the management to see the subject in a more positive light. In this short article I shall mainly be discussing one way in which Grade 9s, their parents and the school management might be reached. 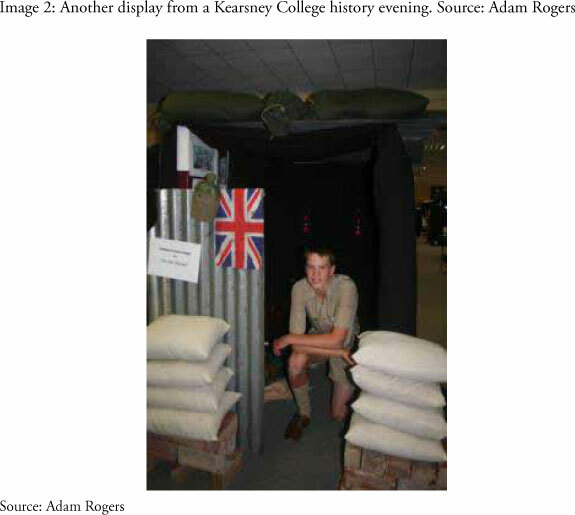 In this case I am referring to the History evenings held at Kearsney College in KwaZulu-Natal. For this event, learners in Grade 9 are given the brief of developing an exhibit on the Second World War Â a high interest section. They are permitted to work in groups or as individuals depending on what suits their learning style. 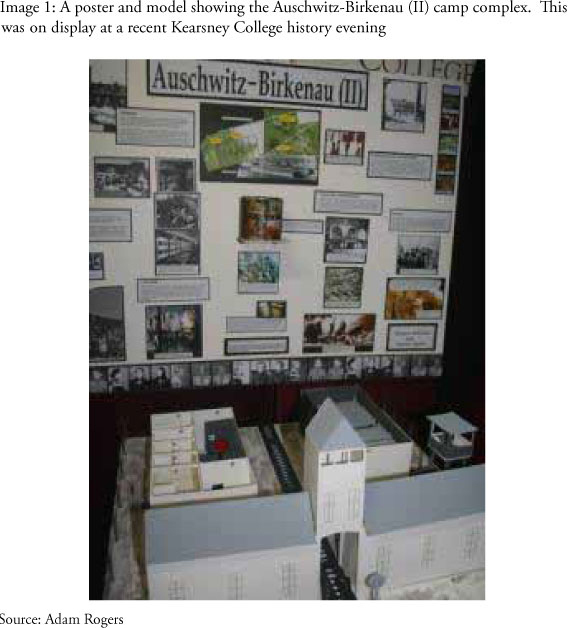 Exhibits can be posters, actual installations or models. The main criterion is that they should make a strong visual impact on the viewers and get their message across effectively. During the history evening, learners, parents and the school management are invited to attend and the best exhibit is given a cash prize. Several variations on this idea are possible. For instance, one school I know has an evening of history dramatisations. 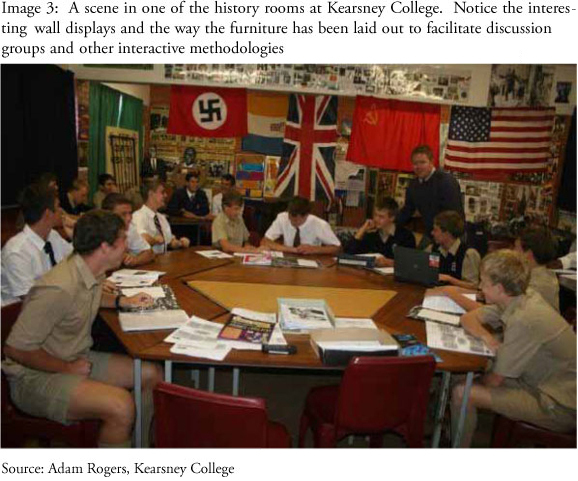 Other less focussed ways of reaching the target groups include a history website or blog or a Grade 9 history newspaper. We live in a very visual age and this needs to be reflected in the classroom environment. Posters, flags, photographs, charts, timelines all need to find a place in our classrooms. Continuing on the theme of the importance of the visual element to 21st century learners, if we have audio-visual equipment and access to the Internet, we cannot afford not to build it into our lessons. There is a wealth of material within easy reach on the Internet. For instance, recently I was teaching the Industrial Revolution to a group of History learners. At some point I was talking about the Newcomen steam engine and was able to offer them a clever animation to show exactly how the engine worked. A shot clip showing a nineteenth-century cotton mill Â now a working museum  in operation was more effective than a thousand words of description. One of the problems with OBE was that it tried to replace one type of orthodoxy with another - the teacher-centred "chalk and talk" method with endless self-discovery through group work (or that at least was how it was inexpertly marketed). The effective teacher needs to vary the approach to suit the subject matter, and there is nothing wrong with either of the above methods, provided it does not become the only way in which the subject is transmitted. Dramatisation  for instance plays based on history. Tours  These do not have to cover great distances. Trips to the local museum or buildings of interest are just as relevant. One interesting one-day trip connected with the Industrial Revolution involved a visit to a traditional spinning and weaving operation, followed by a trip to a modern textile mill. Fieldwork  This would involve learners in practical applications such as the establishment of a school museum. Highlighting career relevance is a key factor, but learners are not particularly attracted to so-called "history jobs", such as working in a museum or being an archivist or librarian. The reason for this is that such jobs are seen as lacking glamour and being low-paying. Promotional programmes should not concentrate on this area. It is a better idea to concentrate on jobs such as law and journalism which are seen as attractive by the younger generation and where there is a close fit between the job and the skills and knowledge imparted by History. History role models are a good idea. These are people who have been successful in a variety of fields who studied history to an advanced level. The British programme had a long list, including the pop star Sting, who was a history teacher, and Sasha Baron Cohen the well-known actor and director, who studied history to postgraduate level at Cambridge University. A key area is to emphasise the importance of the skills learned in History across a wide range of application and especially for any type of study at a university. The value of history in forming an informed citizen with a strong sense of context needs to be stressed. I made a video promoting history in 1993. This covered all the points listed above and more, but it is now too much of a historical artefact in its own right to be of much use. Lobby for improvements to the matric History papers. In their present form, these have several shortcomings which we need organised power to change. For instance, key history skills such as bias and exploring different points of view need to be fore-grounded in the papers much more than they are at present. There is far too much emphasis on simple extraction. Become a conduit for history best practice, which to some extent we already are through our conference and publications. If the money can be found, the society's involvement in the production of a promotional DVD would be of tremendous significance to the subject.